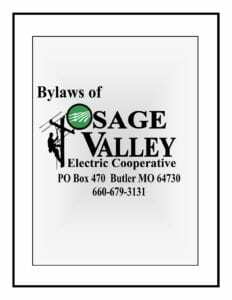 Osage Valley’s bylaws are only amended by a vote taken at our Annual Meeting of the members that own our not-for-profit cooperative. Our members use the bylaws to guide Osage Valley’s management and Board of Directors. The final decision with the cooperative’s bylaw amendments always rests solely with the members. Click the Bylaws icon to view a copy of our bylaws.